My husband and I packed our bags for another short trip; this time our destination was Palm Springs. Is it just me or has the city seen a revival since my last visit seven years ago? Even on a Wednesday, Palm Canyon Drive was bustling with activity. It was nice to see the palm tree-lined streets once again, the desert hills providing a breathtaking backdrop that, as usual, I had a hard time looking away from. 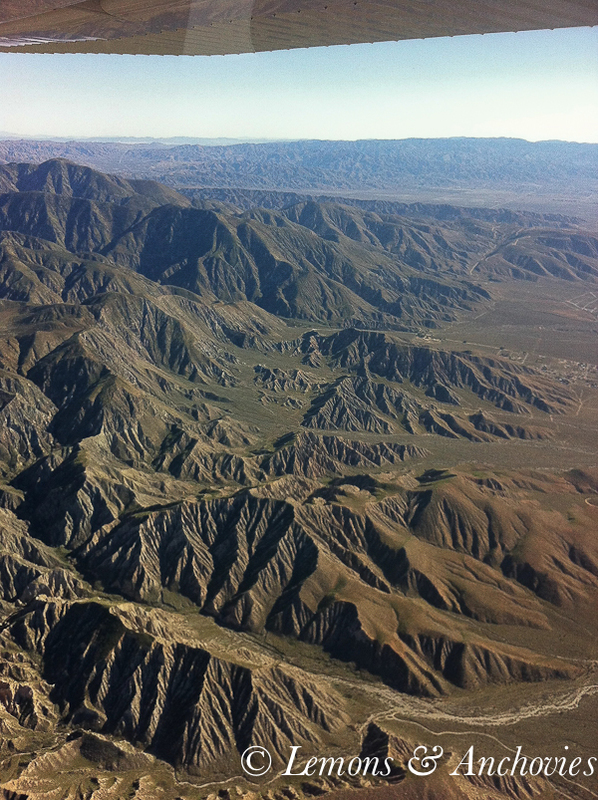 The first two images here are equally magnificent views from a bird’s eye view. 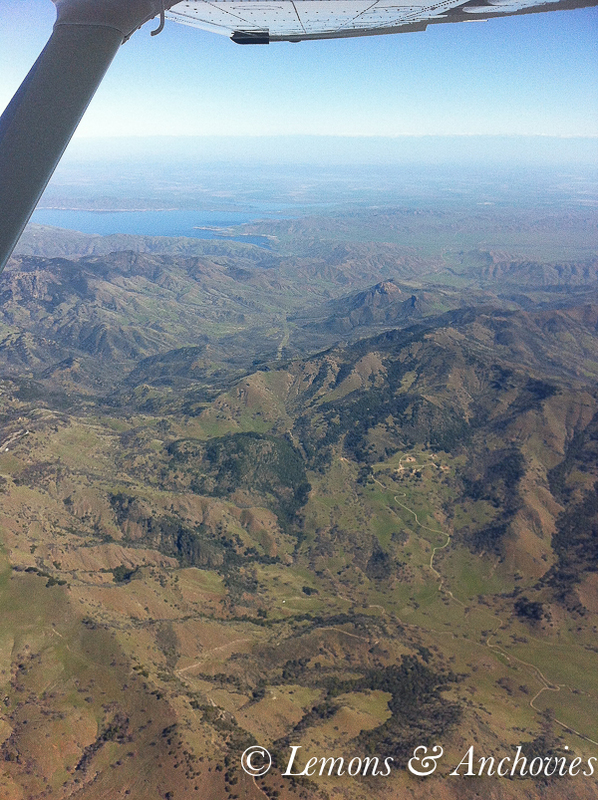 It was smooth sailing all the way as we cruised at 10,500 feet with only minor turbulence as we passed the San Bernardino Mountains and flew through Banning Pass (image above) for the approach to Palm Springs airport. Even after a dozen years of flying in a small aircraft with my husband the “bumps” still get my attention but at least they no longer have me gripping the airplane’s dashboard for security. 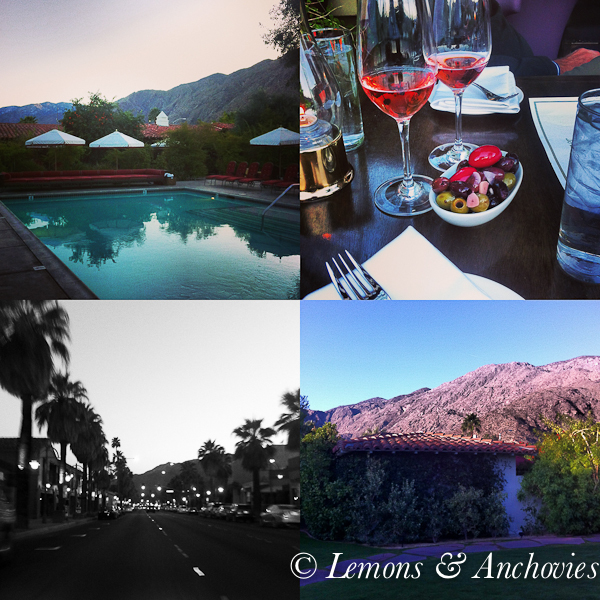 Instagram images from our hotel and a black and white of Palm Canyon Drive. Though we were happy to be in the heart of Palm Springs (with an excursion to Palm Desert) the main purpose of our visit was to see Joshua Tree National Park again. Seven years ago we rode our bikes through a portion of the park, making a day out of pedaling from one highlighted spot on the visitor’s map to another. 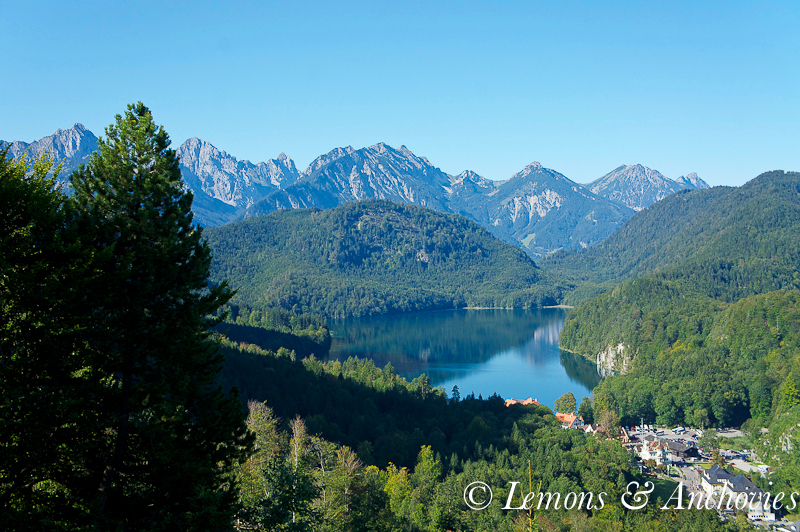 We ate our packed lunches while perched on a boulder, appreciating the beauty around us. 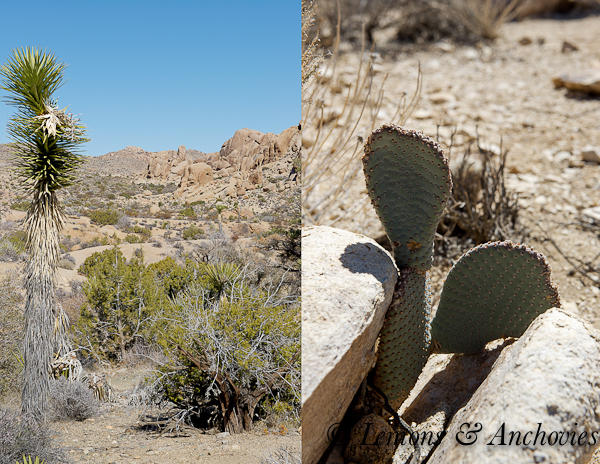 Joshua Tree National Park is the meeting point of two deserts: The Colorado and the Mojave. They differ in elevation, average temperature and annual rainfall but they have common plant and wildlife species. 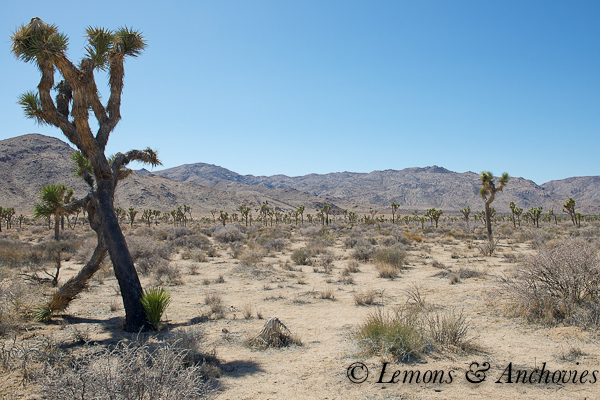 At higher elevation and with cooler average temperatures, one distinct feature of the Mojave Desert is the presence of Joshua trees scattered about the northern portion of the park. 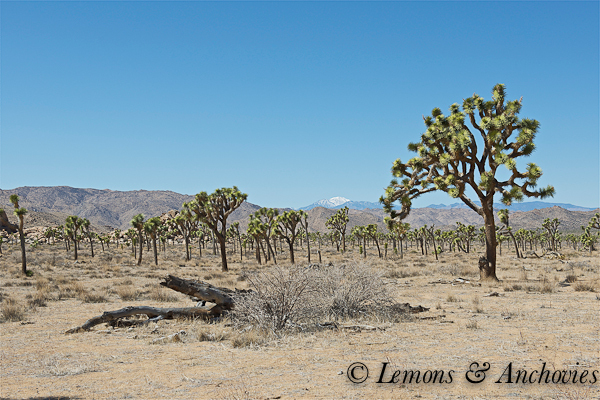 Joshua trees (Yucca brevifolia) are a member of the agave family. Their unusual features add more drama to the parched beauty of the desert but what is impressive is the fact that these tall trees are older than they look. 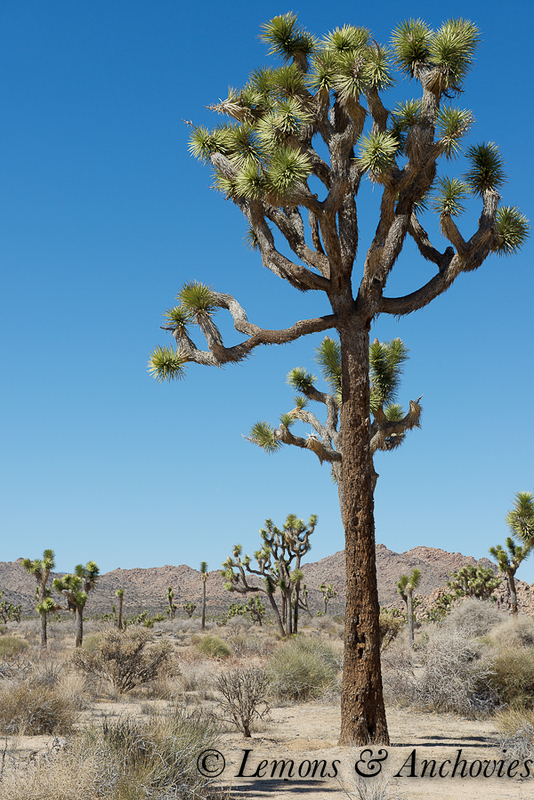 Starting from seed, a Joshua tree may grow several inches during the first five years but, on average, will grow only one half inch per year thereafter. I’ve yet to see the tallest tree in the park–about 40 feet tall–which is thought to be 300 years old…something to look forward to on my next visit. I was anxious to return to the kitchen yesterday but flying has a way of zapping your energy. Even with my husband piloting the plane and me simply acting as backup navigator the 2 hour + flight can be extremely tiring. Maybe it’s being at altitude (we do use supplemental oxygen) or maybe it’s the nonstop activity starting a day or two before we leave but I couldn’t stay awake last night–I went to bed at 7 pm! Today, rested and recharged, I made up for lost time by preparing three recipes. Well, if you can call this one a recipe. I needed nut butter for the first item on my to-cook list (I wanted something other than peanut butter) and didn’t feel like leaving the house for just one thing. I resorted to using my husband’s stash of almonds (he roasted 10 pounds last weekend), figuring he wouldn’t miss a few cups. In no time at all I had this gorgeous, smooth and tasty almond butter. The split images above show the progression from the first stage to the last. 2 1/2 cups of almonds took less than 15 minutes to process. I’ve read that roasted almonds require a slightly shorter processing time so keep this in mind if you use raw almonds. I recommend that you use roasted anyway–the butter has a little more depth this way. It will be hard to go back to store-bought almond butter after trying it yourself at home. And you know what? It’s so easy—and so much cheaper–that there’s no reason to ever buy it again. 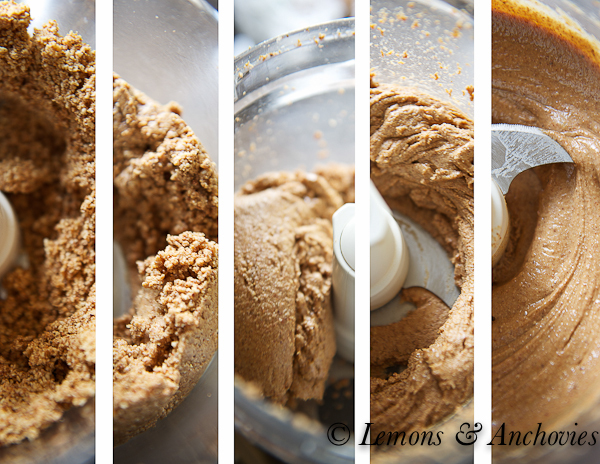 I’ll share the recipe that inspired me to make this almond butter on the next post. Note: The processing time may vary depending on the quantity of almonds and the equipment used. I used my KitchenAid 12-cup Food processor. 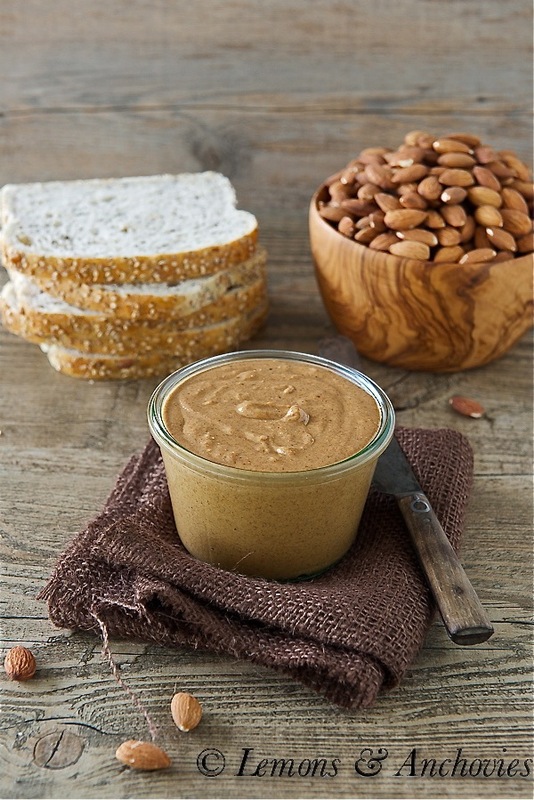 Homemade almond butter is so easy to make at home and tastes much better than store-bought. Process the whole almonds in a food processor. Depending on your equipment it could take 13-15 minutes from start to finish. The almond meal may stick to the sides of the bowl during the first few minutes so be prepared to run a spatula along the sides and restart the machine again. About halfway through the process the puréed almonds will clump into a ball--you can break it down with a spatula or just let the machine do its work. It will eventually break down as the oil continues to be expelled and in just a few more minutes you will have smooth nut butter. The butter is ready to use once it's processed. To roast raw, whole almonds: Preheat your oven to 350℉. Arrange the almonds on a baking sheet and roast for 12-15 minutes, rotating once or twice during baking time. Allow to cool completely to room temperature before storing or using for nut butter. Your almond butter looks so creamy! I’m ready for a late night snack, I think ;). Glad you had a nice weekend getaway! I am SO going to make this!!!!! Thank you! I’m not a huge fan of peanut butter, but I’ve just started eating almond butter and it’s wonderful. I have noticed how much more it costs than regular ol’ PB at the grocery store, which makes no sense to me. I think, then, that I’ll have to try this! How long does it keep? I have some plain almond butter in the fridge that I made about 4 months ago. Totally okay! Only thing is that the almond has finally separated. Just a stir and back to normal! Looks good! almond butter is getting expensive at the stores. I might have to starting making my own now. Do you know how long it lasts? Yum! Looks amazing, what a wonderful idea. I’m sure it is WAY better than store bought! I’m so glad you had a lovely trip down. It’s been a couple of years since I visited, seeing your instagrams is making me itch for a trip down! Love LOVE LOVE the homemade almond butter. I could use a batch for my morning english muffins! This looks delicious Jean! It does sound even better than peanut butter. I’m partial because I prefer almonds more than peanuts. The scenery is just breathtaking! What?!? No added oil? This is awesome!!! I didn’t know almond nuts soley can produce simple, amazing, smooth and crunchy butter! Gotta give this a try! Why did I buy that $10 jar of almond butter when I could have made it at home with guaranteed quality!!! It looks like you had a great trip! I’ve never been to any desert. Or California. I need to change that! And I love almond butter! As long as it has some flavoring (I don’t actually like almond). Maple cinnamon is my favorite. 🙂 Looove these pictures! 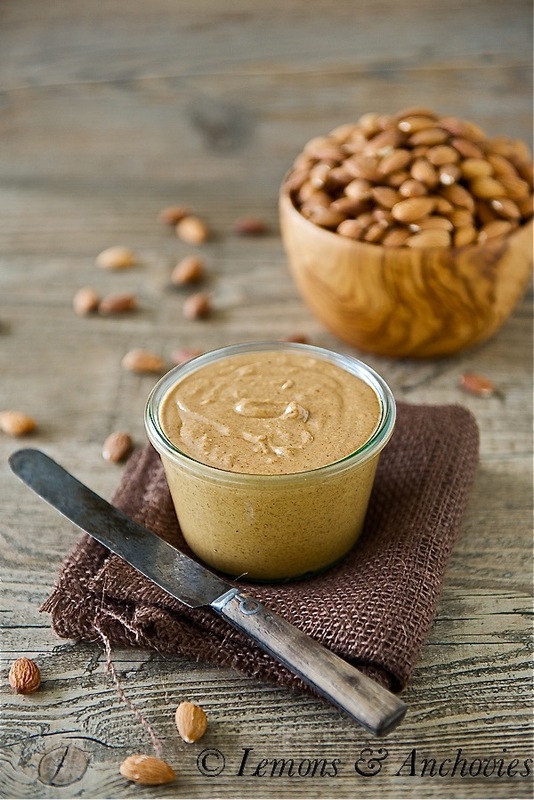 Love making my own nut butters – this one sounds wonderful with the roasted almonds. 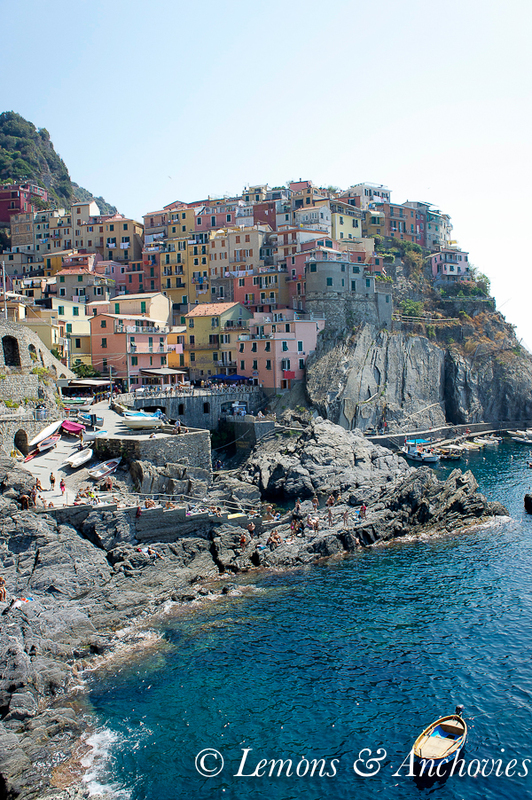 Gorgeous pictures from your trip! I’m totally addicted to almond butter but have never tried making my own. I may have to give it a try if it’s as easy as this looks. Definitely cheaper than buying a new jar every two weeks! Your pictures are beautiful and make me want to go somewhere warm fast! Almond butter is so good (I buy the Trader Joes stuff) I love the idea of making my own! 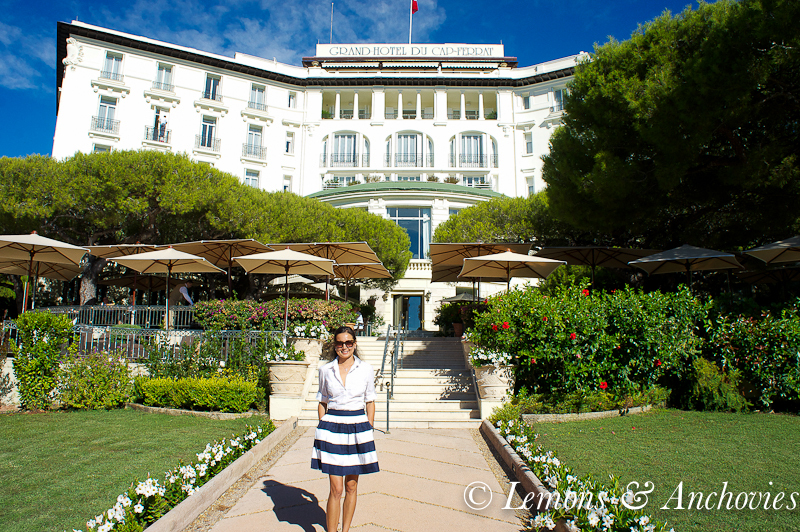 What a great trip you and hubby had! I am with you on the “bumps” – they still get me too. My hubby and I took a short trip to Santa Rosa couple weekends ago and it was bumby big time. I have not been to Palm Springs since Spring Break during college – what an experience. Need to go again and see it from an adult point of view. Smile. 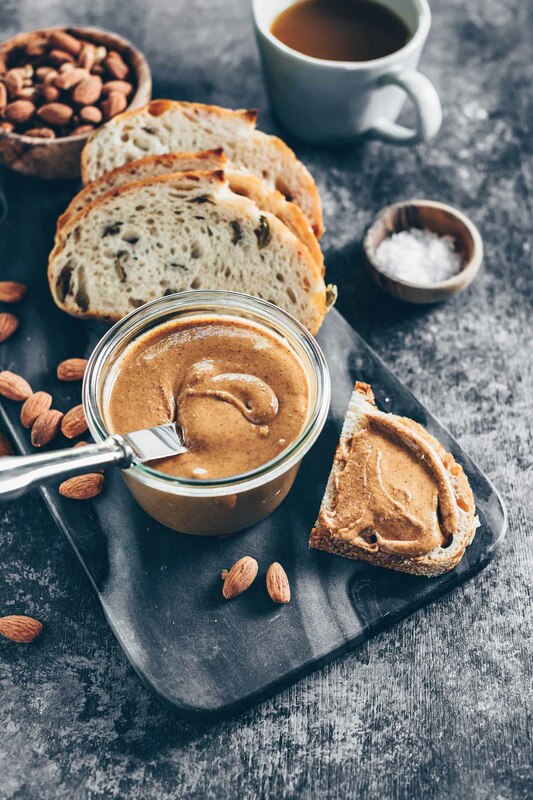 Your almond butter looks and sounds divine! This looks awesome! Where the almonds salted? 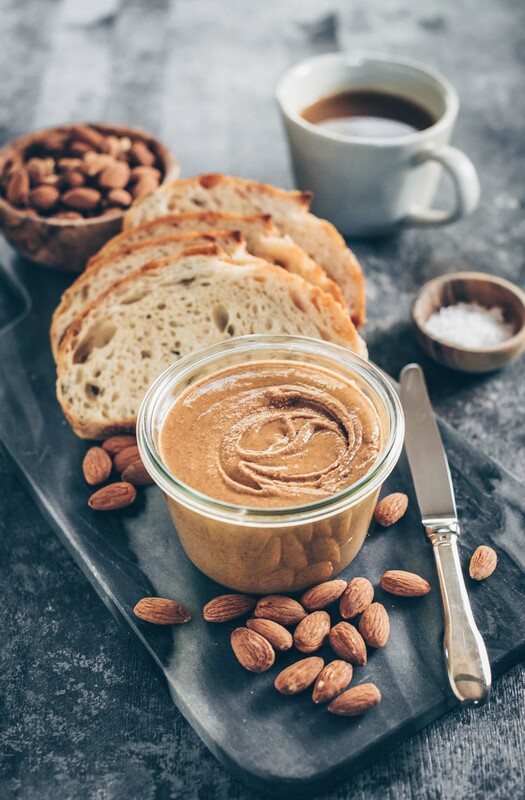 I am really wanting to try this almond butter it looks great and so does your trip. I love the desert and the serenity it offers. Beautiful! I was hoping to make this and send to my mom (I am in VA and she lives in CA) for Mother’s Day. Do you think it will be Ok in the mail or does it need to be refrigerated? Thanks a bunch! Hi, Sarah. I always refrigerate my nut butters because the oils can get rancid pretty quickly. That said, I think it wouldn’t hurt if it was left out for a few days so maybe it would be okay to ship. Not sure, though. So glad you like this recipe! Thanks for sharing the recipe. I have my own almond trees and was looking about to go looking for an almond butter recipe when this one popped up in my inbox. Can’t wait to give it a try. Thanks again. hi.should it be gritty but solid when its done or liquid lke coconut butter ? Hi, Demi. Mine had the texture of regular peanut butter.